Provide comfort for the family of The Wonderer with a meaningful gesture of sympathy. It is with great sadness that we announce the passing of Steven Hillard Ermine late of Prince Albert, SK, on March 21, 2019 at the age of 61 years. Steven was born on August 30, 1957 in prince Albert, SK, to parents: Senator Hillard Ermine and Margaret Rose Ermine. Steven will be lovingly remembered by Rebecca’s mother: Joanne Daniels; his Beepbeem: Rebecca (Benny Wolfe) of Sturgeon Lake, SK; his daughter: Natasha Dreaver of Saskatoon, SK; his special sons: Gordy Napope, Johnathan Napope and Dallas Bighead; his brothers: Bruce Ermine of Sturgeon Lake, SK, Wayne (Jennifer) Ermine of Sturgeon Lake, SK, Chad (Arlene) Ermine of Sturgeon Lake, SK, Kelly Ermine of Sturgeon Lake, SK, and Kevin (Christen) Ermine of Sturgeon Lake, SK; his sisters: Karen Ermine of Edmonton, AB, and Carol (Harry) Felix of Sturgeon Lake, SK; his special grandson: Mark J Daniels; his grandchildren: Caden Bear, Haden Bear, Cage, Zane, Marcus and Tia; his Kookums: Tamara Daniels and Micheala Daniels; his adopted mother: Annie Sanderson; and his special friends: Fred Turner (nip), Brian (Zeke) Roberts and Helen (Tilly) Ballentyne. Steven was predeceased by his loving parents: Senator Hillard Ermine and Margaret Rose Ermine; his nephews: “Abby” Absalom Daniels, Absalom Roberts and Jim Roberts; and his in-laws: John James & Madeline Daniels and Joe Primeau. A Wake Service for Steven will be held on Saturday March 23, 2019 and Sunday March 24, 2019 at the Sturgeon Lake Community Center in Sturgeon Lake, SK. A Funeral Service will follow on Monday March 25, 2019 at 11:00AM located at the Sturgeon Lake Community Center in Sturgeon Lake, SK. 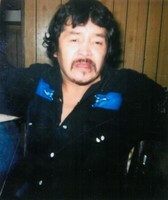 Interment will take place after the funeral at the East End Cemetery in Sturgeon Lake, SK. Arrangements in care of MacKenzie Chapel & Crematorium Brian and Bev Stobbs, Renée Phaneuf - Funeral Directors. www.MacKenzieChapel.ca 306.763.8488. To send flowers in memory of The Wonderer, please visit our Heartfelt Sympathies Store. We encourage you to share your most beloved memories of The Wonderer here, so that the family and other loved ones can always see it. You can upload cherished photographs, or share your favorite stories, and can even comment on those shared by others.